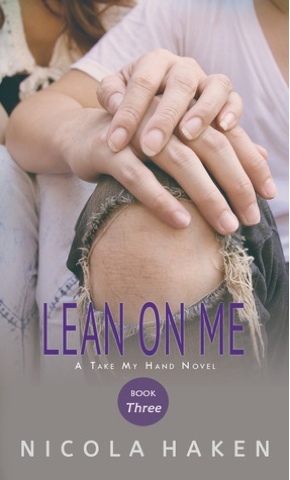 The Take My Hand series has been one of my favorite series I’ve come across in my short time reviewing books, and in the latest volume, Lean On Me, I am not disappointed in the least. In fact, I think this has been my favorite book to date. Lean On Me takes place during the same span of time as Hold My Hand, however this is the story of Jared and Rachel, and what went on back in England while Emily and Dexter were back in the States dealing with the death of Dexter’s mom. Rachel, as we have come to know, is quite literally, hell on wheels. She doesn’t let the fact that she is in a wheelchair stop her from saying and doing whatever it is she wants to do. What we quickly come to realize though, is that Rachel’s over the top personality hides a lot of the self-doubt she carries with her. She constantly feels like she has to prove herself and that she is not worthy of the love and attention that Jared is willing to so freely give her. She puts up a tough girl veneer, not letting anyone, especially someone with such a capacity to break her heart, close to her. Jared recognizes that wall that Rachel has put up around her because he too is suffering from an affliction that makes him “different”. While not a visible disability, like Rachel’s wheelchair, Jared has a condition that could lead others to pity him or treat him differently. I absolutely love Jared and Rachel together as a couple! The witty banter back and forth between the two never gets old and I found myself laughing out loud several times because the two were so ridiculous towards each other, it truly made them endearing characters. I love the friends become lovers trope as it is very near and dear to my heart, considering I married my best friend. These types of relationships to me are so much more “real” than the instalove we see in a lot of NA novels. I like the message that is being sent in the inclusion of a character like Rachel. Even though someone may have a disability, it IS possible for them to lead a normal life. Yes, there needs to be adaptations along the way, and those adaptations may lead to unconventional methods, but just because you have a disability does not mean you need to rely on others. I also loved that we see Jared asking some really stupid, but well-meaning questions along the way. As someone with a disability myself, I can tell you I don’t know how many times I have had to shake my head and keep from laughing at some of the misconceptions people have about my condition. I understand people just want to help, and that they care, but sometimes we just want to prove that we can do it ourselves. Disability robs us of so many things, self-reliance being the major one, however the longer we can hold on to what little grasp we have, the better. Lean On Me was another five star read for me. Again, this is definitely the best of the series because I really love these characters. Their relationship is very real to me, and I can see it only get stronger as time goes by. I can’t wait for the next installment of the series, Never Let Go, which will hopefully be out this spring! We’ll finally learn what Chris is hiding, and see if there will be happily ever afters to go around. Thank you, Ms. Haken, for artfully bringing these characters to life, not just as people in a book, but as friends we’ve come to care about.